If you’re going to get started, these are the easiest easter truffles you should begin with. It’s simple and so deliciously good. 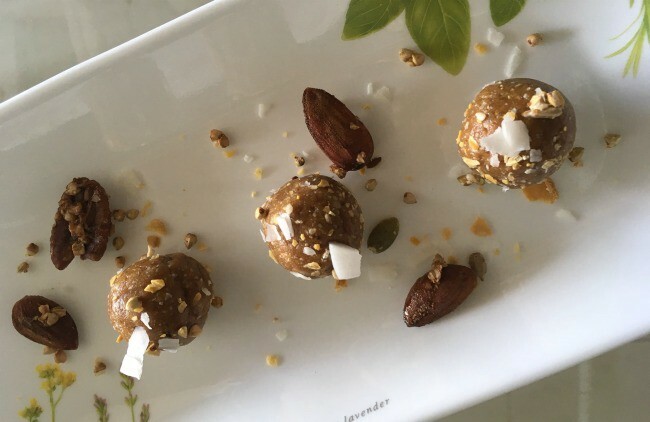 Conventional caramel truffles usually require pure white sugar and a sugar-thermometer, none of which I prefer, but vegan, healthy, refined-sugar free truffles can be rustled up in a matter of moments. Vegan salted caramel easter truffles — without compromising on taste. I describe this mouth-bite truffle as sort of sultry, that is satisfying and light. This truffle looks and tastes like caramel, but far from too intense, without the added butter or oil you’d normally see in other truffles. The Himalayan salt gives the truffle a big of a zing on your taste buds and balances out the sweetness very well. The combination of sweet and salty makes a gorgeous ménage a trois. The ingredients are surprisingly healthy and simple. The truffles can be made with ease — all in one, in the food processor. Vegan & paleo friendly. Place cashews into food processor. Process cashews until nuts are broken down and mixture is consistent — you should see a bit of oil from the mixture. Stop food processor. Add dates and pinch of Himalayan salt. Process again until mixture starts to rise on sides of food processor bowl. The mixture should be doughy and hold together. Decorate truffles with buckwheat, coconut shreds or/and sesame. If you want an exotic version of the truffle I’d just roll it with sesame seeds. Toasted sesame seeds give the truffles a bit more exotic flavour. Health tip: The energizing dates are high in vitamin A, fiber, and iron — helping us protect our eyes and maintain healthy skin. P.S. You can also use the mixture as a raw pie/cake trust. Repeat Step 1 -3 as detailed above and lightly press the mixture into the bottom of pie/cake tin until it is spread evenly. Add your favourite raw cake/pie filling and refrigerate. Originally published at nicolelana.com on April 2, 2017.